This 6th week of the legislative session was marked with sorrow as we lost a friend and colleague, Representative Joseph H. “Joe” Neal of Hopkins, South Carolina. An ordained minister, Reverend Neal was first elected in 1992 and fondly remembered as a “gentle giant” and “friend to all.” His hallmark was a voice of distinction and his passion for the people of our state will remain etched in the hearts of those who knew him and enshrined in the legislative proposals he championed. Please join me in praying for the family, parishioners, and friends of Representative Neal who mourn his death and celebrate his legacy. Rep. Neal was in my freshman class and while we did not always agree or vote the same way. We did it with civility and to represent the people we serve daily. As a result of this shock to the body, our work on the House floor was light, but we did continue committee work throughout the week. Of note was the Real ID legislation. A number of years ago the federal government imposed requirements on the issuance of recognized government identification cards such as a driver’s license or stand-alone identification card. It was another federal mandate on states and we fought full compliance to every extent possible on principle. For years our state, along with many others, applied for and were granted waivers for compliance. However, the time has come where the federal government has said it may no longer grant these special request waivers. Through research and committee testimony, we have determined compliance to carry a price tag of approximately $20 million. While we have again requested another waiver, we are simultaneously preparing to reach full compliance through legislative initiatives. That bill moved out of committee this week and will now be debated on the House floor. This simultaneous approach will ensure no disruption in the lives of the citizens of our state no matter the outcome. We hope with the new administration we will see some change in this mandate. President Trump was back in the Palmetto State Friday morning to celebrate the rollout of Boeing’s new 787-10 Dreamliner. For decades, President Trump has advocated for common-sense policies to get government out of the way of job creators like Boeing. South Carolina. Boeing employees voted overwhelmingly to defeat the union last week, also. 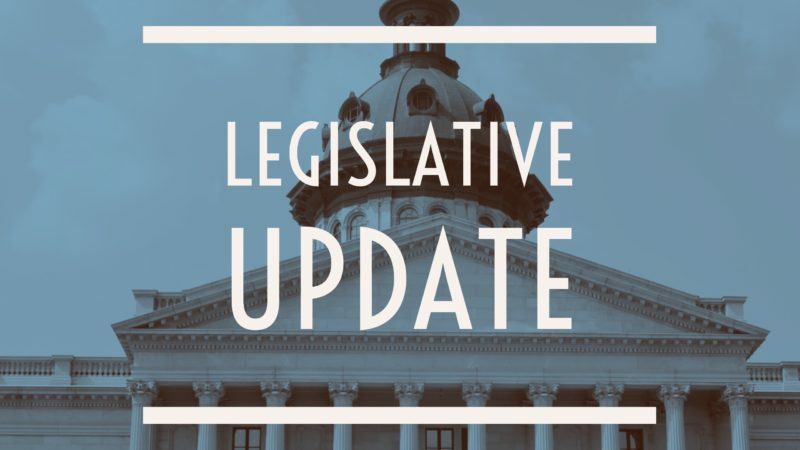 I have heard from many of you on the Road/Infrastructure Legislation, the Business License Legislation, the Pipe Legislation, First Steps (early childhood) and many other bills that are either on the calendar or in committee. I appreciate your input. Many agree and many do not agree. I listen, but I also research the facts, weigh the outcome for our area and our state. I also pray for direction and wisdom before each hard decision that I need to make for our state. We all receive some real harsh words and threats at times. I pray to understand the emotion that some feel and they need to vet to us. Please know my vote will always reflect the betterment for my family and yours. Please know you are why I serve. Your input, concerns and needs are always welcomed.